The Lessons of Golf | The Secretan Center, Inc.
My father was a scratch golfer, defined by the USGA as a player who can play to a Course Handicap of zero on any and all rated golf courses. My Dad golfed, or caddied with, and for, the best golfers of his day and could easily have turned pro. He labored unsuccessfully to instill this skill in his son, and to this day, I side with Mark Twain who, reputedly, said, “Golf is a good walk spoiled”. But I am a keen observer of golf, for its lessons in humanity, the elegance of the sport, and the gorgeous locations in which it is usually set. Golf is an incredible metaphor for life. It requires great skill and mastery, but more than anything, it requires attitude. The course itself produces all kinds of traps, hazards, and surprises, and how we deal with each of these tells us much about the human holding the club. I once worked for a leader who refused to hire anyone until he had played a round of golf with them – even if they didn’t know how to play – because, he reasoned, there was no better measure of someone’s character. The recent epic success of Tiger Woods is an example. His self-inflicted wounds from what Thomas Friedman has termed, “industrial-scale marital cheating” and his four major back surgeries would probably have put most people out of the game. 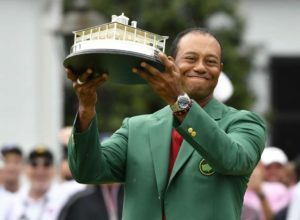 As Tiger Woods observed, “Last year, I was lucky to be playing again.” It did put him out of the game for 10 years, during which he failed to win a single major tournament, because he couldn’t muster the authenticity and passion necessary to be the best in the world. And he could sense the antipathy and distrust of his fans as he walked through the gallery. All of this translated negatively into his game. But as he recovered his attitude, ignored the naysayers, repaired his life and kept his focus on being a champion again, he finally came through in the most incredible way. One doesn’t have to be a fan of golf to understand the magnitude of what Tiger Woods pulled off in Augusta. Thomas Friedman, an avid golfer, has written a brilliant op-ed piece in The New York Times which explains this in more depth. When we get depressed, or beaten, disillusioned or disappointed, and when we are faced with all of life’s hazards, traps, surprises, and our own mistakes, it’s the right time – perhaps the best time – for greater resolve and commitment, and to dial up our passion, so that we can perform well and live large. Arnold Palmer quoted in Golf as Meaningful Play by Wolfgang Schmid: Golf is deceptively simple and endlessly complicated. A child can play well and a grown man can never master it. Any single round of it is full of unexpected triumphs and perfect shots that end in disaster. It is almost a science, yet it is a puzzle without an answer. It is gratifying and tantalising, precise and unpredictable; it requires complete concentration and total relaxation. It satisfies the soul and frustrates the intellect. It is at the same time rewarding and maddening – and is without doubt the greatest game mankind has ever invented. Wonderful quote – thanks David! Sounds like you speak from experience Patrick!